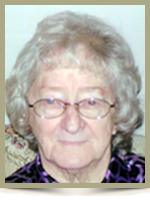 Fisher, Muriel Blanche, 79, of South West Port Mouton, Queens County, passed away on Friday, July 5th, 2013, in Roseway Hospital, Shelburne, surrounded by her loving family. Born in Port Mouton, she was a daughter of the late Victor and Jean (Roy) Bowers. Muriel had many hobbies and enjoyments, some of which were volunteering her time to many local charities and organizations, baking, cooking, cleaning, watching wrestling on TV, gardening, camping, listening to old time country music and variety shows. She is survived by her loving husband Lester; daughters Lillian (Borden) Colp, of Brooklyn, Annette (Randy) Whynot, of Bridgewater; son James Leslie, of Kamloops, B.C. ; half-sister Viola (Rocky) Roy, of Port Mouton; half-brother Richard (Linda) MacLeod, of Port Mouton, numerous grandchildren and great-grandchildren; special nieces Mary Ann Carver, Madeline Williams; special nephew Darrell Carver. She was predeceased by her first husband Perry Leslie; sisters Marie Theriau, Mae Dowling; brothers Gilbert and Keith. So sorry to hear of Muriel’s passing. I remember many fun times years ago. Thinking of you all. Our thoughts and prayers are with you!!! She was a very nice lady and enjoyed talking with everyone no matter where or when you seen her!! I am very sorry for your loss. Muriel was a very kind lady . She will be missed. You are all in my thoughts and prayers. We are saddened to hear of the loss of Muriel. She was a great lady & will be missed by all who knew her. Our condolences to you all on the loss of Muriel,Our thoughts and prayerst to you at this sad time. To the family of Muriel Fisher we send our sympathy. My thoughts & prayers are with you @ this time. Take good care. Lil, Annette, Jimmy and family – So sorry to hear of your Mom’s passing. We are thinking of you at this very difficult time. Lillian and family; sending our sincere sympathy; our thoughts and prayers are with you. To all of Muriel’s family: We are sorry to hear of the loss of your wife and mother. Our deepest sympathy. Lillian, Annette and families; I felt sad when I read of the passing of your mother. She was a nice, friendly lady and loved her family very much. Mom and Dad always enjoyed she and your dads’ visits. Sincerely,Doris. To Lester and Aunt Muriel’s family- Our thoughts and prayers are with you at this very difficult time. Hold on to those cherished memories, she will live forever within your hearts. Love Farin & Corrina. Dear Annette and Family: I just heard this morning of your mother’s passing. I am so sorry for your loss. She sounded like a great person to be around. Prayers and sincere thoughts to all of you. Take care. I am so sorry to hear of your mom’s passing. Such a sad time and I want you to know that you are in my thoughts and prayers. Sending condolences to your family as well. Lillian, Annette, Jimmy and all of Muriel’s family: I am so sorry to hear of your mother’s passing. I have many, many fond memories of good times spent with Muriel in her home in Port Mouton, and at family events. She was a really sweet, caring woman who had a very kind heart and an ability to make everyone she met feel very special. I loved going with Lisa and the other grandkids to her place overnight, she always made me feel like I was “one of hers”. My thoughts and much love are with all of you at this sad time. Muriels Family,our prayers are with each and everyone of you at this sad time.God Bless. Our deepest sympathies in the loss of your mother. Our thoughts and prayers are with you during this difficult time.